As you know, we love packing light. It’s just easier for us. One strategy I’ve adopted over the last year to streamline my own packing is the travel capsule wardrobe concept. A capsule is a limited set of clothing (you pick the size) from which you can build a huge set of clothing by mixing and matching. Often you can construct your capsule from items already in your closet, so no need to run out and buy special “travel clothes”. The most important advice I’ve heard for building a travel capsule is to bring clothing you love wearing – because you’ll be wearing them a lot! Related: Wondering what to pack your minimalist travel wardrobe in? Check out the best travel backpack for women. What are the parameters of the trip? Think about weather, formality, specialized activity needs, and especially what types of footwear will be appropriate. What colors will you use as a neutral? What is your accent color? How will you bring in color, pattern and texture while ensuring that you can mix-and-match your clothes and accessories? After answering these questions, I start planning. I’ve done it nearly every way: pen and paper, excel spreadsheet, and Stylebook app (for iPhone and iPad). There isn’t one method that I strongly prefer and sometimes I’ll use a combination of all three! Stylebook is a nice option if you can put in a little time to set up your clothing (even if it’s just what you plan to bring for a trip!). 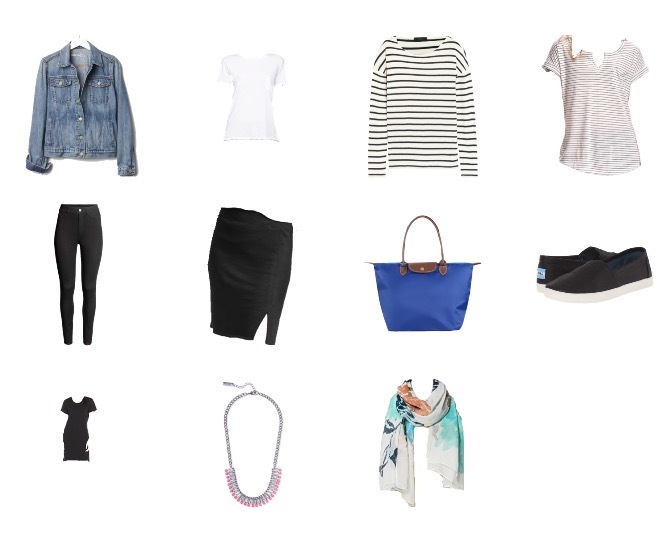 You can build outfits you might want to wear and the app adds the right pieces to your packing list. The big question, of course, is what specifically to bring. If you’re going away for a week to a destination with decent weather you could probably get away with three or four tops, two bottoms, one dress, one outer layer like a cardigan or a light jacket and two pairs of shoes. Even if you’re traveling to a colder climate, throwing on multiple layers can save you from bringing bulky outerwear. Here’s an example for our upcoming trip to Paris with the kids. We’ll be there five days and daytime weather will probably be in the 60s with nights in the 40s. We love to walk everywhere, which means comfortable shoes are a must. We don’t have any special activities or fancy dinners planned (we are traveling with preschoolers, after all) so I’ll be bringing casual clothes including a few pieces nice enough for dinner out. Black is the easiest neutral for me to work with in a capsule wardrobe for travel in Europe, and I’ll incorporate some color with a nice springy scarf and my très Parisien tote bag. That’s a total of seven pieces of clothing and four accessories for five days (a 10 piece travel wardrobe, plus one pair of shoes). Not bad! If you’re traveling for a few weeks, 13 pieces of clothing would be a great amount. For me that might be six tops, four bottoms, an outer layer and two dresses- but the details depend on the weather and your personal style. Here are some of my favorite travel outfits for Europe. These are all pieces that I own and wear often, so I feel comfortable wearing them and I can avoid spending travel money on clothing. All three tops can work with either bottom and with the jacket and either the scarf or necklace. T-shirt dresses are ideal travel dresses for Europe because they’re versatile and easy to care for, though I’ve been tempted to try this awesome travel dress as well. I’ll probably throw in a pair of tights to go under it (or the skirt) on chilly evenings. I even feel like I can get away with just bringing my TOMS Avalon slip-ons; they’re very comfortable for walking, but because they’re made of coated canvas they have a more finished look. Check out these other great travel shoes that will keep you walking all day long! The best part? If I wear the jeans, a shirt and jacket on the plane I can fit the rest of the clothes in a medium sized packing cube with room to spare. More space for souvenirs! OneBag – my original inspiration for traveling light! Have you tried a travel capsule? Could you do it? I need to do this! On my to do list before our new trip! It’s definitely worth the effort! This is such a great idea and I’m definitely trying it. I hate packing and I think this would make it so much easier for me. Very good and interesting post. No, I have not tried this but I have been thinking I should. This definitely makes me want to try it soon. Thanks for the great tips. I’ve only just heard about capsule wardrobes through Justine Leconte, and yours is amazing! Thanks for the inspiration. I need to put together one now! This is so helpful! It’s inspiring to think I can pack so light and still look cute! Thanks for sharing! My husband has an easier time for sure, but when we were packing for a year-long trip recently he learned that he has to be a little more thoughtful about what coordinates!